Swaziland is a very special place when it comes to wildlife safaris. Africa has many safari destinations, but few that offer the intimacy of game-viewing as in Swaziland. Having escaped the hype of destinations like Kenya and Tanzania, and not subscribing to the upmarket pretentiousness of South African and Botswana safari camps, Swaziland is only under-rated by those that haven’t been here to experience what insiders have known for years: Swaziland is a African safari gem. There 5 major parks in Swaziland and a host of smaller ones. 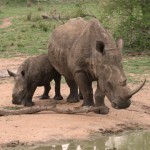 Hlane Royal National Park and Mkhaya Game Reserve are the BIG 5, big game highlights. Both parks are managed by the Big Game Parks of Swaziland organisation, a private-public partnership that has delivered and outstanding wildlife conservation record over the past almost 50 years. These outings include a private return transfer from the Mbabane-Ezulwini-Manzini area. Game-viewing in the reserves is undertaken in specialised game-viewing vehicles provided by the parks authorities. Another option is our outing to Mlilwane Wildlife Sanctuary – which is a very different type of safari altogether. Mlilwane is situated just south of the fast-developing Ezulwini Valley area and is a vast green lung just off the pulsating peri-urban area nearby. The park is dominated by non-dangerous species (if you consider hippo, crocodile and ostrich non-dangerous!) and allows activity-based exploration of the park. This includes walking, bicycle and horseback trails in addition to the more conventional open-vehicle game-viewing. Our Swazi Trails safari to Mlilwane includes a return transfer, plus a choice of one of these adventurous activities. Families or groups may even split up between activities – so ensuring that your experience is a very personally satisfying one. Online bookings for Mlilwane Wildlife Sanctuary – main rest camp and beehive villages. “Our tour company was born at Mlilwane Wildlife Sanctuary, when founders Bev and Paul Ozard, set-up a caravan in the camp-ground. From here they ran and operated the business from 1987 onwards, using a fleet of old beat-up VW combis. And if you think that is the only way you can interact with the game parks in Swaziland – wrong! Swazi Trails also offers a Sundowner Safari at Mlilwane, as well as a half-day Mountain-biking Safari that departs directly from our offices in Ezulwini.